ABOUT US / Social responsibility_Printing machine|Printing machine-Hebei Wanjie Machinery Technology Corp.
Conscientiously implement the decision and deployment of the government and the state capital committee, pursuit harmonious win-win situation of enterprise development and social development, take the real commitment of corporate social responsibility, to create a harmonious enterprise environment. Strengthen the sense of social responsibility and inherit social virtues, caring for the disadvantaged groups and being generous, rescue the desperately poor and help those who were in difficulty，and with dedicated love. 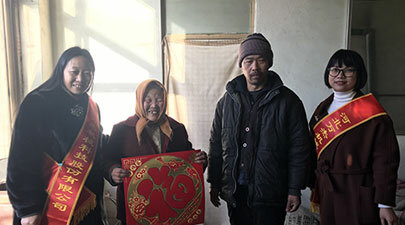 Actively carry out accurate poverty alleviation, providing regular help in certain areas, and perform charitable donations, student funds supporting, and difficult assistance activities, Wanjie technology has donated with a total of 70000 Yuan for poverty alleviation in 2017. Always adheres public welfare is a great and noble cause, leading the employees continue to study the scientific outlook on development, continuously renew the concept of charity and make greater contribution to the construction of harmonious society.